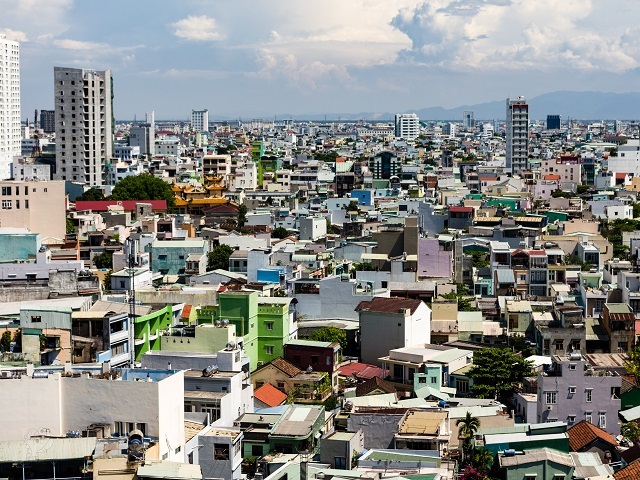 The government of Da Nang, Vietnam has prioritized building efficiency as part of its new Resilience Strategy to address public health and economic risks from climate change. In 2016, the city began working with the global Building Efficiency Accelerator (BEA) partnership. Local leaders are developing ways to signal to property developers, owners and building managers that efficiency is a public priority, and it is essential to work together to implement locally-relevant efficiency actions. To understand more about driving action on efficiency in Da Nang, WRI’s Shannon Hilsey talked with two local change agents: Dinh Quang Cuong is the Director of the Climate Change Coordination Office and the Chief Resilience Officer for Da Nang. Amit Prothi is an Associate Director for 100 Resilient Cities, working out of the Singapore office on resilience challenges in Da Nang. The interview has been edited for length and clarity. Shannon: Why did you choose to work on energy efficiency? 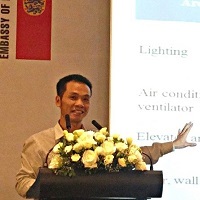 Cuong: I chose to work on energy efficiency in Da Nang because I was encouraged by the city’s vision and policies for energy and the environment. City planners are trying to build Da Nang into an environmental city. It is an active and modern city, engaging with both adaptation and mitigation, with some initiatives focusing on energy efficiency. I was also encouraged by the Paris Agreement in 2015, when Vietnam committed to reducing greenhouse gas emissions 8-25 percent by 2030. Da Nang is one of the most important parts of the country to take action on that commitment. Amit: I come from an architecture and urban planning background. When I was a student, I became more and more interested in sustainable urban development. I’ve been striving throughout most of my career to look at how urban development can be more sustainable. Not just buildings, but how complete cities can be more sustainable. When you look at where urbanization is happening globally, much of it is in Asia. I wanted to get involved with how to make a difference in Asian cities because right now we are at a point where much of the projected urban development hasn’t happened yet. We have an opportunity to set into place new practices that are resource efficient and that see bigger returns. Da Nang is a great example: The city has grown from 660,000 people in 1997 to more than 1 million now, and it is projected to double by 2030. To accommodate current and future residents, the city must continue to develop and expand. We have the opportunity to influence this development, including a stronger focus on building efficiency. How does building efficiency fit into Da Nang’s economic, environmental and social goals? And, more specifically, as experts that have worked on resilience plans for Da Nang, how can energy efficiency support the city’s resilience efforts? Amit: Da Nang is one of Vietnam’s five major cities, and it is one of the fastest growing. It is also one of the most attractive travel destinations in Southeast Asia, so foreign direct investment funnels into the city, spurring large-scale urban development. 100 Resilient Cities supported Da Nang to develop its Resilience Strategy. During that process, we identified economic resilience to be a key element: How does Da Nang ensure it stays economically viable in the future? When the city reaches 2.5 million people in 2030, will there be jobs for everyone? A key stress that was highlighted during our discussions is the power supply—while it is sufficient today, could it be problematic as Da Nang keeps growing? Hotter periods related to climate change are expected to increase energy demand in the future. Additionally, Da Nang has ambitions to develop clean industries utilizing advanced technology. Will the city be able to access a sustained power supply that is required to support such industrial development? This is where the BEA comes into play. It gives Da Nang the timely and much-needed opportunity to explore how to become more resilient to power shocks and continue expansion of its industrial and service base to accommodate future growth of the city. What actions is Da Nang taking to improve building efficiency, and why were these actions selected? What are the main challenges to implementing them? Cuong: Da Nang has been working on building efficiency for many years. Looking to the future, the city is planning to implement energy solutions for 2017- 2022 in four key areas: 1.) how to enhance energy savings in hotels and public buildings; 2.) how to develop recycled energy in the city; 3.) how to save energy in industrial manufacturing and 4.) how to use energy efficiently in public lighting areas. We are trying to plan areas in the city where we can develop solar energy. Within the framework of the BEA, there are three areas: 1.) how to build policy about energy savings; 2.) implement energy saving management solutions in one hotel (2-3 stars) and 3.) set indicators to track the progress of energy savings in the city and within the project. We are creating a guiding document to encourage relevant agencies in the city to cooperate with each other on how to supervise and track the progress of energy savings in Da Nang. One of the biggest challenges in implementing building efficiency is securing financial resources. We have high demand, but resources are limited. The second challenge is that energy efficiency is a fairly new field, and not all people clearly understand the benefits. Third, it is really difficult to influence investors to spend money on energy efficient technologies and persuade them on the cost-benefits of doing so. Last, but not least, the regulations from the central government aren’t strong enough to be effective and aren’t very adaptable. 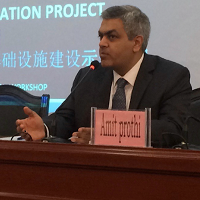 Amit: Right now, the building construction industry in Vietnam is used to the old products. There is an evolving market for newer energy-efficient products, but those tend to be costlier. As the market expands, and the up-front cost of building energy efficiency starts to go down, you will see more of the market picking this up on its own. Cuong talked about what the government is trying to do, but, from the private side, there hasn’t been much awareness. What I’m hopeful for in Da Nang stems from tourism and the big hotel chains. As those big groups focus more on energy efficiency, most likely from a branding and resource efficiency point of view, they can lead the charge on building efficiency. How did the leadership and vision emerge for this project? Who have the critical players been, and what roles did they play? Cuong: The approach of the city is to include not only city government but also the private sector, universities and research institutions in the BEA project. All of these players are important for the development of BEA activities in Da Nang. Therefore, identifying one key player is hard. But, from my perspective, the city government is the leader in this process. Amit: The country has made a commitment to reduce greenhouse gas emissions at the highest level. That mandate is trickling down to cities, like Da Nang, to see how they can start to address this at their end, particularly given that they will be growing quickly. Da Nang has capacity needs, both in terms of knowledge and resources. This is an area that requires a considerable amount of investment. We are trying to position Da Nang at the receiving end of global funds, knowledge, technology and resources. Cuong, as the Chief Resilience Officer, can become the long-term champion of these issues. When he retires, he can look at what he has done for urban resiliency for our children and grandchildren. That’s my hope.